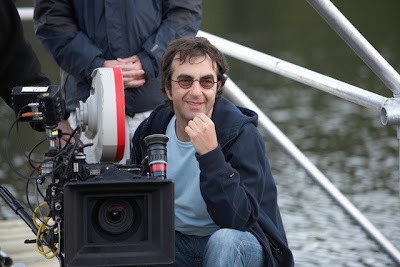 Despite the fact that nothing about the fascinating, flawed yet maligned Where the Truth Lies was conventional, Oscar nominated director Atom Egoyan shares that the confines of the traditional mystery paradigm didn't allow him the chance to let his storytelling unfold organically. Yet needless to say that in addition to MPAA wars from casting high profile actors in a taboo take on Martin and Lewis, Egoyan doubled his workload even further by unraveling the incredibly complicated Sherlock Holmesian locked door mystery across two different time periods. However, even when he returns to “smaller budget” works like this mesmerizing, morally multi-layered study of individual and familial identity in the technological age, mysterious intrigue lingers from minute one. The overwhelming beauty of his haunting visuals hits you on a sensory level while watching a young woman play a violin outdoors on an early fall evening at the edge of a dock. It's an image that we will return to and one that sets the film's events in motion as an emotionally charged recollection of the past. On another level, it appeals to your aesthetic side since it represents what may most likely be Egoyan's last work to have been shot on film stock as he laments in a candid interview included on Sony's Blu-ray release of the Cannes winner Adoration. A stark contrast to the exploration of the thinning line between those who broadcast and those who watch online, Egoyan's opener is stunning in its clarity, dreamy sentimentality and elegant simplicity. Moreover, the idyllic image of the talented violinist seems naturally infused with love from two audiences that she isn't aware are watching. The voyeurs witnessing it remain onscreen in the form of her young son and adoring husband, as well as the rest of us offscreen basking in the cinematic gaze of the glowing photography coordinated by Egoyan and his crew and on ardent display in the Blu-ray transfer. It's these dual audiences-- or duality in general-- that becomes the focus of Adoration. And instead of the traditions of either glorifying or demonizing technology or making oversimplifications about our dual identities on and off the web, Egoyan subtly reminds that in addition to trying to deal with our issues online, we must make a physical journey to resolve our objects of destruction or adoration. Thus the artistic irony of the movie having been shot on film verses digital further enhances the impact of the outdoor sequence of music and love before some poignantly claustrophobic moments take over. 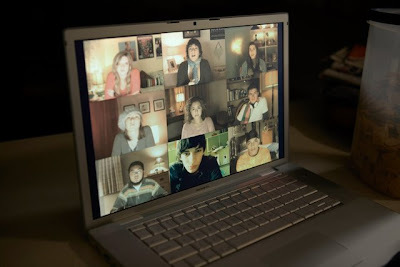 Based on experimental and improvisational labs of the way citizens respond to and perform for web cameras, Egoyan floods us with indoor shots of a main character in front of his computer screen that augment intriguing contradictions regarding the concept of alone verses "together" in cyberspace. And although he denies that it's a straightforward mystery or as genre specific as Where the Truth Lies since Adoration evolves and demands participation since it plays with vague assumptions and red herrings throughout, Egoyan's startling achievement works on our minds as though it were a mystery. The result of the contemplative style makes nearly every plot description a spoiler risk. While the opening question in the advertising and synopsis asks "what would you do if you found out your father may have been a terrorist?" which is a timely question since news reports have revealed war on terror has moved online, essentially that query is a tease. At its heart, Adoration centers on a young man's need to uncover ironically just "where the truth lies" in terms of the accident that took the lives of his parents years earlier. The film gets going when the French teacher (Arsinee Khanjian) of Simon (Devon Bostwick) asks the class to translate a true account of a terrorist who packed off his unsuspecting pregnant girlfriend to the Middle East with a bomb in her luggage set to explode in the air. Listening to the piece while others scribble diligently along, Simon crumples up his assignment within moments, sits up straighter and begins to rephrase it from a report to a narrative and one that is told in first person. Penning the piece as though he were the baby inside his mother's stomach and the bomb plot was stopped by airport security before it occurred, when Simon's disturbing tale is shared with the rest of his high school and he posts it online, it sets off a global chain of events with consequences that reach both near and far. The furthest effects are visible instantly via endless video chats and recorded messages sent to Simon from those all around the world whether they want to analyze the morality of the actions of "his parents" like amateur CNN pundits, are offended by his having shared it and tried humanizing "his father" when Holocaust survivors join the debate, or when the prejudiced and twisted come out of the woodwork. Yet while this narrative of the events is interesting, Egoyan is astute in illustrating that after five minutes of yelling or opinion gathering, it just all becomes noise of people wanting to be heard instead of legitimate action whether it's sharing their experiences to teach or trying to change things via volunteerism. Using the technological transmissions as if they were a broken record of testimonies and confessions, Egoyan ensures they follow Simon on every single electronic device throughout the course of the film. Still the real story unfolds when a physical journey is made and he uncovers much more about the one device that may hold the key to understanding his parents and who they really were as opposed to how he wrote them when he learns more about the violin his mother played and how she met his father when she needed to get it repaired. 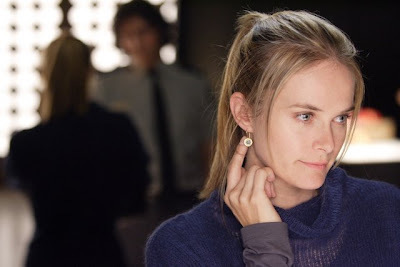 This is achieved as Egoyan weaves together intimate flashbacks of his blissfully in love parents (played by Rachel Blanchard and Noam Jenkins) from Simon's past with the his present life shared with his hardworking and embittered uncle (a phenomenal Scott Speedman). Easily the most fascinating character in the film, Speedman's Tom is outraged at his nephew's teacher for calling up all of the family's unfinished business with an assignment that Simon took to extremes. Yet, soon we sense there's as much pain about the death of his sister and her husband for Tom as there is for Simon but for different reasons altogether. 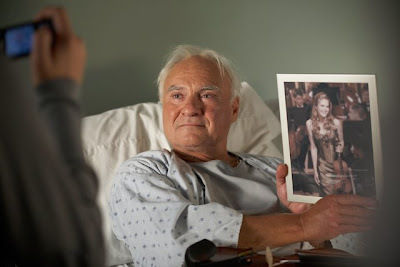 Additionally, in a psychologically revealing conversation Tom has with a stranger, we realize that he's completely unable to use the name of Simon's father and we grow more intrigued by his ferociously protective need to keep the young man away from his own father (Kenneth Welsh) who hated the deceased man he told Simon was a killer. And much like his nephew, Tom goes on a physical journey as well when he literally crosses paths with the teacher unexpectedly without realizing who she really is as well as her connection to their life. 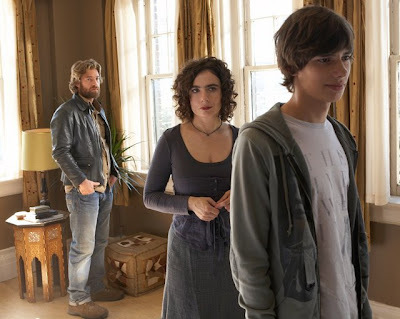 Since Simon's parents were an interracial and interfaith married couple, prejudice, tolerance, and the way these views are passed on from one generation to the next obviously plays a part in the film that revisits the director's passion for studies about individual identity. However, the complete story of the relationship between all of the characters and what exactly happened in the accident that killed both parents is as compelling as any traditional mystery. Gorgeously captured on Sony Blu-ray, the transfer boasts a wonderful sound balance to match its quiet power and stunning cinematography that's rounded out by several worthwhile making-of and film-school quality extras. Richly rewarding intelligent cinema that is anchored by a moving turn by an understated Scott Speedman, Atom Egoyan's Adoration stands as not only one of the director's best works but also one that begs to be seen twice and discussed passionately with others.